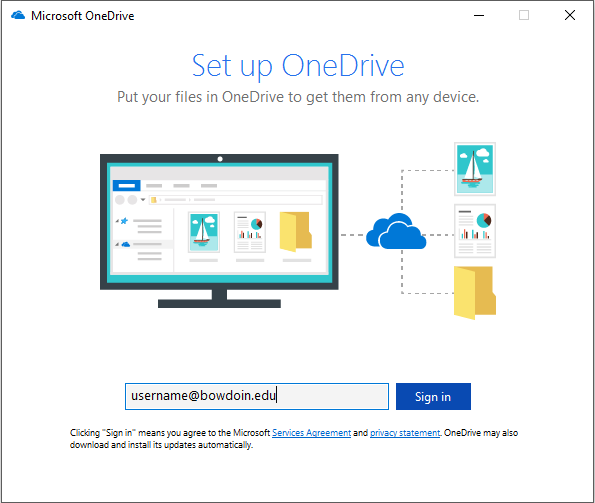 In order to synchronize documents from OneDrive online to a local computer, the sync client needs to be installed and setup. In most classrooms, computer labs and faculty and staff workstations the sync client is already installed. If you see the OneDrive sync client's cloud icon in the Task Tray on Windows 7 or Windows 10 or in the Finder menu bar in MacOS / OS X then you can skip to the configuration step below. 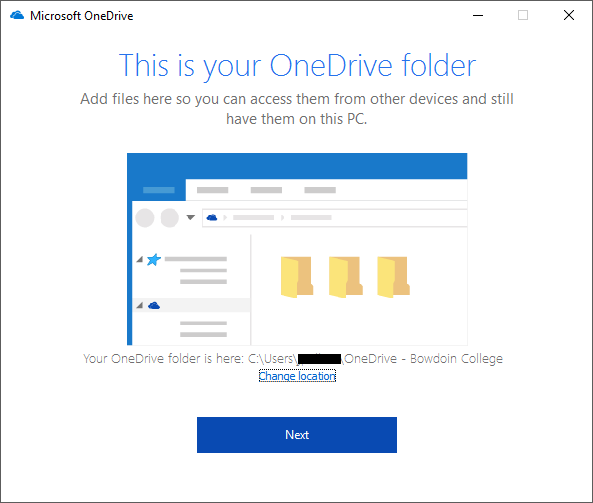 The OneDrive application should already be installed on most computer. In certain classroom and lab locations, however, the application does need to be installed. The installation is per-user and administrator privileges are not required. 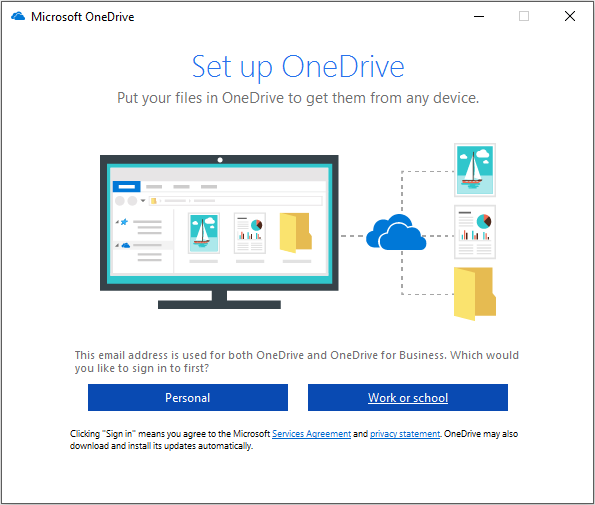 OneDrive will install with no additional input from you. 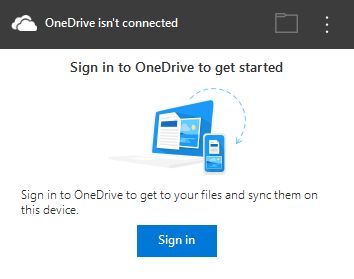 The OneDrive application should already be installed. If not running, it is usually located in the Applications folder. If it is not there, open Managed Software Center and search for OneDrive​​​​​​​. Click Install under the application information and then follow the instructions on our Managed Software Center article listed under Related Articles on the right, if necessary. Configuration of the OneDrive client is similar for both MacOS and Windows. Follow these steps to configure the basic sync settings. Click on the OneDrive icon either in the Task Tray in Windows, the Finder bar in MacOS or by launching the application itself on either OS. Select any listed folder(s) you'd like to have sync with OneDrive. Folders will only show up if there are folders in OneDrive online. If there are no folders or files listed, you're all set. Any file or folder you place in your local OneDrive folder will automatically sync up to OneDrive online. Once complete, if you had any folders to sync, they'll download. Once complete, if you click on the OneDrive icon you will see a notification that all files are in sync. 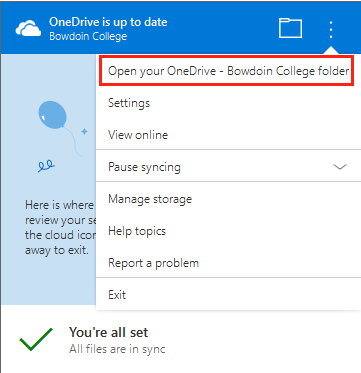 To more easily locate the files on your computer, click the OneDrive icon and select Open your OneDrive - Bowdoin College folder. A window will open with all of the files that have either synced down or be available for you to drag and drop files to sync up to OneDrive.